You and I both know that getting our students engaged in what we are teaching is the most important thing we can do. Without engagement, the kids just don’t learn. When it comes to technology and students, we are competing with a massive number of distractions… YouTube, Social Media, and a never ending fountain of information and entertainment. One of the most powerful methods for engaging students I have found is bringing that technology into the classroom in a meaningful way. There has never been a better time in history to be able to easily get in contact with a teacher from another City, Country… or Continent! The best free service I’ve used to do this is called ePals , and 10 years ago it put me in touch with a teacher who lives on the other side of the world. Our classrooms have been in close contact ever since, and we’ve both seen the engagement of our students go through the roof whenever this is involved in our lessons! We started out in regular email contact, and could pair the kids up with their own “ePal” in our respective classrooms, to have conversations back and forth on many different topics. Over the years we have built on this, sharing everything from handwritten letters to cultural gifts and books with each other (which has been extremely exciting and interesting for both classes). Live video feeds (and recorded video messages for those in different timezones) have also become a super effective part of this learning method. 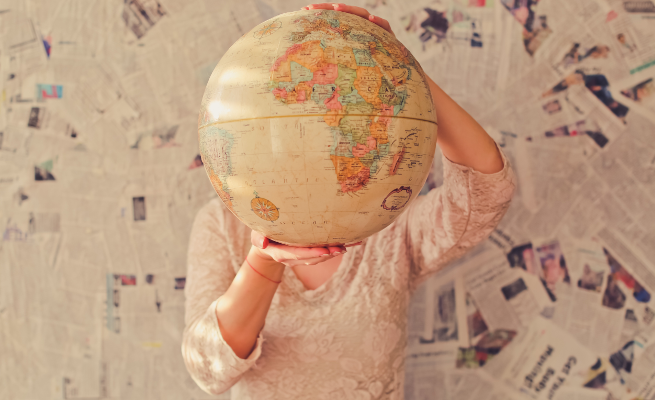 What are the benefits of Global Learning? When students (who often have a very small world in which they live day to day) start regularly talking with a fellow student in another part of the world, this massively changes their world view – sparking all sorts of exciting new ideas and interest in topics which could otherwise feel too dry or theoretical for them in purely written form. Sending their video and written messages back and forth with kids from another country, and getting to know them in the process, gives them a very personal view into how a whole different group of people live and think, in a way that they can totally identify with (which would not be possible it were people of a different age to them). Ironically it can be shared interests and similarities that help create the bonds between the children – favourite books or movie characters for example – which help them forge closer ties to people who they previously have had no contact with. This has many positive flow on effects on their education. What are they? We’ve seen reluctant writers start writing enthusiastically every week. We’ve seen totally disinterested kids become excited about coming to school to learn about these other places and children, and run home to eagerly tell their parents about things they’d learnt along the way. Perhaps most of all, it is this broader view of the world and it’s people that is most exciting of all – it builds the groundwork for young people who become interested in things that are further afield, and sparks an interest in learning about new ideas, cultures, and ways to live and think in this world. How do I start using ePals in my classroom? It’s just so simple to get started too – as a teacher, all you need to do is signup for a free account (you’ll see the SignUp button at top right of the home page). You’ll then be able to filter the huge number of Classrooms by age group, country, language and other factors to find a classroom that you think would be a good fit for your students to communicate with. You can then message that classes teacher to gauge their interest and suitability. From there, the options are endless! We have found that each class setting aside a portion of a wall in their class to dedicate to maps, flags, and interesting information from the other class and their home country has been a really wonderful centerpiece for this ongoing collaboration. New online tools such as SeeSaw (which offers a free account for teachers that we use) have been great for us too. The main reason for this is that we are in vastly different timezones, so enabling the kids to have live video feeds to talk has been difficult. SeeSaw allows us to quickly and easily leave video messages for each other, to continue a discussion around how we live our lives, or what animals we have in our Countries, and so on. The safety and privacy of the children is also of utmost importance, and through SeeSaw they are only able to access this content in the classroom under teacher supervision – and the content private, only able to be viewed by the two teacher’s accounts. Our classroom of 6 year olds now have a morning ritual of using the iPad to facetime the Teacher in another country to check in on the days happenings, and hear stories of wild animal encounters. The children now know how to independently use our SeeSaw account to post pictures, video messages and share their work with their own ePal. This helps build a sense of pride in their work, and a shared journey of learning. 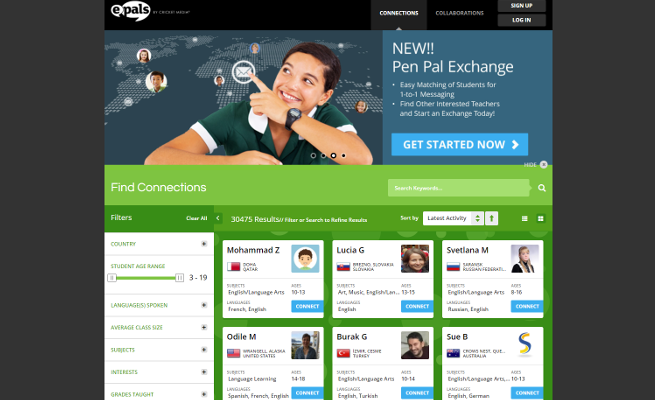 How can I take ePals global learning further? My current class of 6 year olds are getting a lot from the methods I’ve discussed with you above, but for older students you’ll find many further effective teaching techniques! For students you’re wanting to expose to foreign languages, I’ve found it can be really fun to connect to a French class for example. Your students can then have daily conversations with French children, who are fluent in that language. Naturally this benefits both classes, as they’re able to work on the other’s language just through natural conversation. The ePals site also features Collaboration Projects, which can be joined by many teachers from around the world. These ePal Collaborations cover a huge number of topics – from fighting poverty, to having the students try and negotiate a trade deal, to designing robots that can navigate another schools natural landscape. How can I integrate ePals into other learning areas? While speaking with fellow students from another part of the world can be a powerful teaching method in itself, there are any number of other learning areas that can be helped by this connection. Information Reports (e.g. 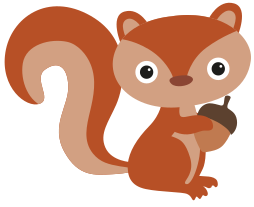 animals of that country) – Great opportunity to learn and incorporate topic specific words (e.g. Talons, belong to an Eagle, that was discussed). Hand Writing – another practical and interesting way to work on letter formation skills. Non-fiction text for group reading sessions, based on the country (students can skim and scan the text to find information, and can use this to complete follow up reading activities such as making posters and comprehension activities. Learning songs and dances from the ePals country (we present a Thanksgiving play each year using our ePals script). Visual art – painting, drawing, sketching, collage (of animals, landmarks and historical figures from that country). Bringing your classroom into close communication with students from another country is a powerful teaching method, which not only builds student engagement, but also massively broadens their world view. This is a hugely empowering teaching technique, helping take your excelling students to the next level, and also bringing disengaged students into the discussion, helping them discover the joy of learning about new people, places, and ideas. How about you? What do you see as a benefit of global learning through communities such as ePals? Learn effective teaching methods with tips and insights only shared with our free newsletter subscribers.